Founded in 1895 in Paris, Le Cordon Bleu is one of the most prestigious names in hospitality education sector in the world. It has a long list of illustrious alumni, including the cooking techniques of the world-famous American chef Julia Child, who inspired the 2009 Hollywood feature film, Julie & Julia. Today, Le Cordon Bleu has a presence in about 44 countries through its international network of schools. More than 20,000 students of 100 different nationalities are trained in fields of culinary, hospitality and tourism at these schools each year. The Le Cordon Bleu School of Hospitality at the GD Goenka University that was established in 2013 is part of this global network. Located in Sohna, Haryana, the sprawling campus with its manicured greenery and spotless buildings is well over an hour’s drive from New Delhi. Although somewhat remote at the moment, the area is expected to develop significantly in years to come, offering greater connectivity. For now, though, transport can be a potential issue for students thinking of a daily commute, which is why many opt for the convenient and comfortable campus accommodation. For the past few years, several universities in India, especially private names, have been entering into collaborations with prestigious global institutes. However, it is pertinent for students to understand the level of collaboration between the two before being lured by the name and seeking admissions in these institutes. Dr. Y.G. Tharakan, Dean of the school, who has spent over three decades in hospitality education, says that the collaboration with Le Cordon Bleu would not have been possible without meeting its exacting global standards. “We mean it when we say that we offer ‘world class’ pedagogic practice, technology and infrastructure to students. It would not have been possible any other way,” says Tharakan. “Right from staff and student selection to monitoring student performance and placement and organising visits by renowned international chefs, Le Cordon Bleu is closely involved with every aspect of the education we impart here. Their name is prominently displayed on our degree and diploma certificates and we have to take this very, very seriously,” informed Dr. Tharakan. A trip through the campus infrastructure with professors Saurav Chhabra and Gurudutt Rohit only corroborate this. They take special pride in introducing their demonstration kitchen, top-of-the-line six-combi ovens, and blast freezer. “You can make ice-cream here in seconds! Apart from this, the school also has house-keeping and front office experiential labs and specialised software such as Fidelio, Micros and IDS. Digitisation is impacting the hospitality industry in a big way. Students need to be aware of the software being used in the industry so they are as job-ready as they can be,” they inform. 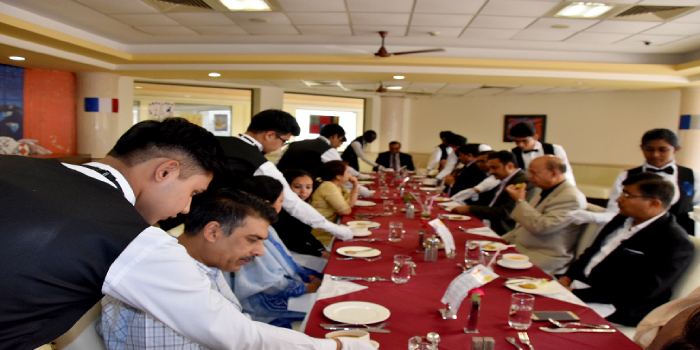 Currently, the school offers seven courses at various academic levels - Bachelor of Hotel Management & Catering Technology (BHMCT), Master of Hotel Management & Catering Technology (MHMCT), Master of Hotel Management (MHM), MBA in Accommodation Operations Management, MBA in International Hotel & Restaurant Management, Post Graduate Diploma in Culinary Arts Management (PGDCAM) and a PhD programme in Hotel Management. Of these, BHMCT and PGDCAM are the most popular ones. The BHMCT is a four-year, broad-based undergraduate programme that includes all the fundamentals such as from hospitality management concepts, fundamentals of the hotel industry, commercial kitchen operations, food & beverage service and restaurant operations to key principles of human resources, revenue management, customer-centred sales & marketing, hotel engineering, business law, French and specific finance & accounting for the hotel industry. PGDCAM, on the other hand, is a highly specialised course that is open to students from any specialisation, who have an interest and the aptitude for donning a chef’s hat. It includes all components of working in the kitchen, ranging from procuring, storing and handling ingredients, reducing wastage, ensuring hygiene and sanitation and preparing all manner of dishes that are not only appetising but also profitable to make. Batch sizes are relatively small, not exceeding more than 25 students, and admissions are based on a common entrance test and personal interview. So far, the institute has had a formidable placement record both in India as well as overseas. Yash Somani, a first-year student of BHMCT, has been offered a paid internship for five months in the patisserie kitchen at the Hotel Le Parc Obernai in France. “Every year BHMCT students are required to spend a term on industry placements. The school helps us with these internships based on our interest and aptitude. I was extremely interested in learning more about the French cuisine and managed to get this through the school,” said a beaming Somani. Bhavesh Rathi, on the other hand, wanted to experience the full gamut of roles within a hotel and would be interning with Marriott in Jaipur. “I would be involved in food & beverage service, kitchen, housekeeping and front office at different points of my internship,” said Rathi. Le Cordon Bleu School of Hospitality, GD Goenka University, is truly bringing global standards to the hospitality education through its programmes, pedagogy infrastructure and the outlook. Is Gd Goenka University Gurgaon is best for MBA?? When will application forms for GD GOENKA UNIVERSITY available for 2019? I want to take admission in bsc agriculture .how can i contact you . For mba which college is better gd goenka,jk business school and iiebm indus business school? Your GDGU brochure has been successfully mailed to your registered email id .